I have always been involved in music in one way or another; I first started working with live bands as a sound and light operator. I started in Radio, supporting a hospital radio station called Radio Lollypop in Birmingham Children’s hospital, where I worked in the record library and helping to produce shows, interviews and requests on the wards and eventually presenting my own show. 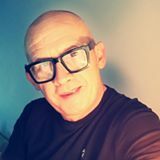 I in late 70’s and 80’s I was a resident DJ at the Birmingham Night Out, the Benidorm Palace of the Midlands and was also guest DJ for Browns, Sam Wellers and the Power House night clubs. Join me for Breakfast every Saturday morning from 8am till 10am.